Grand Rapids teens are learning to see the assets in their communities. 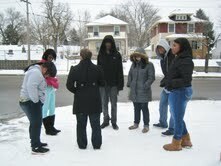 On Saturday, March 16 teens from across the community in the Grand Rapids Initiative for Leaders GRIL U program were seen walking the Roosevelt Park and Madison Square neighborhoods looking for assets. These young leaders have been going through leadership trainings each week since September learning about themselves as leaders, their role as leaders in their homes, schools and the city, what it means to be a balanced leader, what it means to be a Cross Cultural leader and now what it means to lead in the city as a teenager. On their asset mapping walk, they learned to look at the buildings, look at space, listen to the sounds, smell the smells and to see the hope that exists. They also were challenged to look at their current roles as leaders – what are they responsible for? What change can they cause? They will be spending the rest of the month dealing with these questions as well moving towards their role in fighting injustices. Stay tuned the week of April 22 where groups of teens will be spotted leading Silent Demonstrations in our city raising awareness against injustices. For more information on GRIL, email us or call (616)301-6697.